When the Archbishop of Patras gave the curtain behind the royal gates to the klephts, who could not agree on a symbol, he gave to the Greek revolutionaries the standard of the Cross which is now the symbol of the Hellenic republic, as it was the symbol of the Kingdom of the Hellenes. When we realize that there is substantial identity between Orthodoxy and Greeks, we see the logic of the choice. But we cannot assume that because Greeks are Orthodox they are automatically good. The same Greek revolutionaries were able to degrade Kollokotronis and imprison him in humiliating circumstances. I have been into his prison, in Nauplion: cold, hard, narrow. It can only be entered and exited by crawling on hands and knees. Greeks did that to a great Greek. Greeks have a remarkable capacity for anarchy, for self-centred decisions and for vengeance. 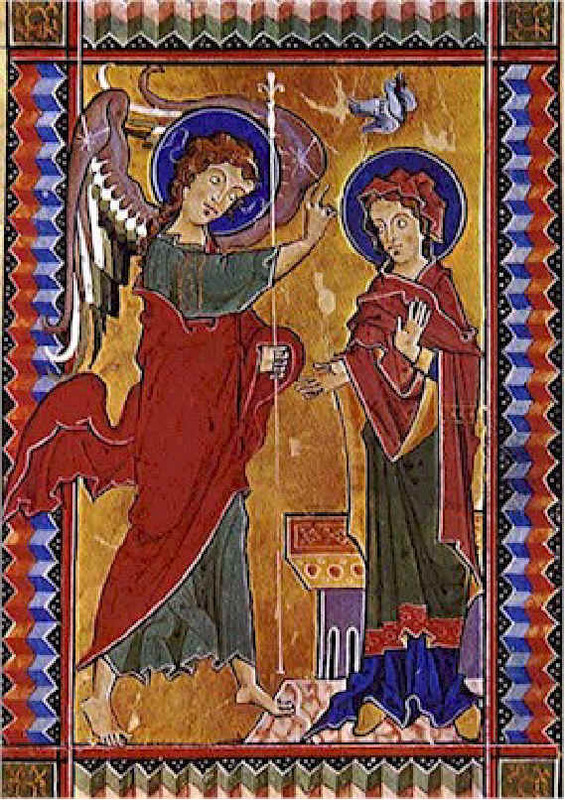 It is therefore most appropriate that the National Day is the day of the Annunciation. For as Mary is the beginning of our salvation, it is her acceptance of suffering which makes our redemption possible. "For the one who sanctifies, and the ones who are sanctified, are of the same stock; that is why he openly calls them brothers... It was essential that he should in this way become completely like his brothers so that he could be a compassionate and trustworthy high priest of God's religion, able to atone for human sins." Each one of us is drawn into this relationship through baptism; and it is only a matter of degree. We think of the saints, and special the Panagia, as partaking of Christ's holiness (Heb. 12, 10) and as being 'parts of the same body' - syssomoi (Eph. 3, 6); because for Paul the mystery of Christ can include even outsiders in the same inheritance of salvation. The Greek war of independence was the outcome of many forces, both the endless frustrations of being humiliated by oppression from the Turks, and the admiring and sometimes fantastic and misplaced enthusiasms of foreigners who, like Byron, valued classical Greece. Without those foreign interventions, the division of Cyprus will continue. There is a savage and depressing continuity in Hellenic history. Ignatius of Antioch in the first century of the Church's life had affirmed that Mary was forever virginal and was mother of God; St. Justin in the second century was the first to affirm that she was associated in the work of redemption. St. Irenaeus repeats that she is Mother of God and virginal; St Efraem the Syrian says of Christ "Thou alone and Thy Mother are in all ways wholly pure; for in Thee is no spot, and in Thy Mother no stain." Our Lady fills a place in the mind of Christians from a very early point in history of the Church, and we can remember that the Parthenon was preserved by becoming a church dedicated to her. The first church which we know to have been dedicate to her is at Ephesus, the church in which the Council of 431 was to be held. I have stood by it, and prayed her prayer at it "Rejoice Birthgiver of God, Mary full of grace, the Lord is with thee..."
The first form of devotion to Our Lady is that in which pictures show her with Christ, usually at the birth of Christ, and these pictures show the Panagia as subordinated to Christ. It is our typical Orthodox way of representing her. But a tendency arose in the fifth century of showing her receiving tribute of prayer and glory in her own right, as in some of the mosaics at Ravenna. This resulted from the heresy of the Monophysites, which wrongly saw Christ as only divine. Thus Mary was given the power to redeem which had been intended to be recognized in Jesus. Because of the Monophysite heresy, people looked up to Mary as the perfect representative of human beings. But the term Theotokos, Birthgiver or Mother of God, had been used by the Church since the third century, because Jesus is divine as well as perfectly human; and as she has become the Throne of God by her acceptance of the motherhood of Jesus, so she is "more honorable than the Cherubim, and beyond compare more glorious than the Seraphim." And during the Divine Liturgy, in the Anaphora, we make this exclamation to the Theotokos, Axion estin!, because she is the gateway to salvation. Through her choice history has been changed, by her giving of birth the way to overcome death has been opened. Hail, O Lady, unfathomable depth, inaccessible summit, O ever-Virgin through whom we have been made divine!" Be kind to us, and save us who are drowning in countless sorrows: protect your flock against the snares of the enemy." In September 1943, a German unit drove towards the village of Skripsou in central Greece to exact reprisals. The Panagia appeared, and the vehicles stopped in confusion. Right up to recent years, a surviving former German officer made an annual pilgrimage to Skripsou church to pray for August 15th. But apart from several icons in the church, showing the event when the Mother of God spread her protection over the villages of Skripsou and Disthomo, there is no special mark on the church: no little books available, no signs to tell what happened. Mary did what a Mother will always do - suffer in love because love suffers long and always. So in Chios, where the massacre of 1821 led to the development of foreign support for Greece, there are cases at Nea Moni of the skulls of the martyred monks, showing sword cuts and even deep entry wounds into frontal bones. But there is no written publicity, no signs. Greeks live with the past, and often they live in the past, and that is normal. "neither death nor life, no angel, no prince, nothing that exists, nothing still to come, not any power, or height or depth, nor any created thing, can never come between us and the love of God made visible in Christ Jesus our Lord." (Rom.8, 39). That is the precise function and status of Our Lady. And what she consented to do by becoming Mother of God was to be the reason for that sacrificial struggle for independence in 1821. Without the Cross, there would not have been an independent Greece. Without the Cross, there would not have been a resurrection. We must never confuse the ethnos (the nation) with the apokalypsis - the revelation. But we must always make the ethnos carry the burden of the apokalypsis, so that the cosmos may reflect the glory of Christ. © Dr. M. R. Brett-Crowther.